The Toyota brand is known for a lot of things, but perhaps most notable is their commitment to reliability. With plenty of Toyota models still confidently on the road years after purchase, drivers that show their Toyota a little TLC can expect it to provide dependable transportation for the long haul. In addition to being uber reliable, the Toyota lineup has a wide range of available body styles and powertrain options which makes it easy for most car shoppers to find something that fits their needs. Whether you need a fuel-efficient sedan, a compact crossover for weekend adventures, an SUV built for people moving, something a little more trail-ready, or perhaps a pickup truck with plenty of towing power, the Toyota lineup has you covered. 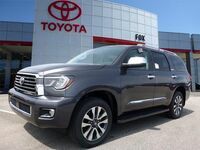 Browse the new and used Toyota cars, trucks, and SUVs available now at Fox Toyota in Clinton, TN near Knoxville via the link below. Current Toyota Sedans: 2019 Toyota Yaris, 2020 Toyota Corolla, 2020 Toyota Corolla Hybrid, 2019 Toyota Camry, 2019 Toyota Camry Hybrid, 2019 Toyota Avalon, and 2019 Toyota Avalon Hybrid. Current Toyota Hatchbacks: 2019 Toyota Corolla Hatchback, 2019 Toyota Prius, 2019 Toyota Prius c, and 2019 Toyota Prius Prime. Current Toyota Crossovers and SUVs: 2019 Toyota C-HR, 2019 Toyota RAV4, 2018 Toyota RAV4 Hybrid, 2019 Toyota Highlander, 2019 Toyota Highlander Hybrid, 2019 Toyota 4Runner, 2019 Toyota Sequoia, and 2019 Toyota Land Cruiser. Current Toyota Trucks: 2019 Toyota Tacoma and 2019 Toyota Tundra. If a new model doesn’t fit in your current budget, Fox Toyota also offers a variety of popular Toyota models on their used lot that offer lower starting price tags that deliver plenty of bang for the buck without sacrificing on style or amenities. Connect with the Fox Toyota team via the pop-up form below and let us know what you are looking for in a new or used ride and we can help you get the research or purchasing process started.